Those Scootered Handicapped! There Outta Be A Law! Those power scooters are everywhere! 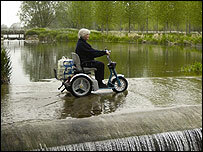 Ok.. they make perfect sense and there’s no question that they aid in the mobility of those that can’t get around. The Pride Pursuit. Hold on tight! It’s good technology. In fact, many times I check these things out with a measure of mechanical envy and I dare any guy to admit that he has never had a passing thought about racing one, or souping one up to travel at mach 3 (ala Home Improvement), or putting a snow plow on the front. In a way they are kinda cool and I have to fight the impulse to try one at the local Wal-Mart. But then there’s that little twinge of guilt that creeps in that says, “Don’t think like that because some people need those scooters all the time and don’t have fun choices to make in life.”… yada, yada. It’s kinda like when your mother told you not to make that funny face to emulate less fortunate people because God will freeze it like that forever. The EV Rider Royale, for super heroes. We all are familiar with those TV commercials for the Hoveround, the Rascal, and The Scooter Store, but I bet you didn’t know there are lots of people making these things out there. In fact, the names of these makes and models are diverse… and strangely play on certain self-fantasy just as we might when we purchase a particular car. The “Prowler”, the “Daytona” (I’d worry about the person wanting that one), the “EV Rider” (hehe… yeah, right), the “Pride Victory” (vets might like that one… uh, WW2 vets, that is). The “Golden Companion” might be a warm fuzzy for Grandma; not sure who might want the “Golden Avenger” (kinda reminds me of an aging postal worker; get out of this person’s way for sure). The Golden Avenger. Be afraid of who's driving this one. I suppose if you are an aging law enforcement officer you could opt for the “Pride Pursuit” (that thing has the 29 mile per charge range). There’s a model called “The Osprey“, which sorta brings to mind that Marine vertical take-off airplane that cost a zillion bucks, didn’t work right for a long time, and resulted in a number of deaths. Uh.. I think I found where the beef went. 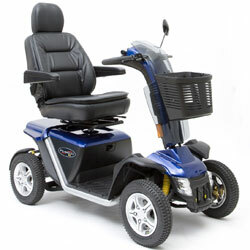 Anyway.. cool as they are and as great as they are for allowing less ambulatory people venture into life, these things are NOT built for the open road, much less traveling sidewalks and walkways. By design, none of these things are road-ready and quite honestly when you get a 250 pound person (or greater, as these things tend to be obese-person magnets) on one the center of gravity is so high that one has to take care flipping it over on a sharp turn at max speed. Regardless, I see these things on the highway all the time; a threat to traffic and the riders themselves. Why?? Accidents involving these power scooters and chairs are increasing each year as more of these end up on or along the highways. In fact, there have even been pedestrian deaths as a result of being struck by scooters on sidewalks and walkways (there are even legal questions as to whether a power chair scooter is a pedistrian or vehicle). So what is happening here? Well, to understand that you have to recall who would require a conventional wheelchair. While there are semi-ambulatory people of sound mind and resonably sound body that can be part-time users of wheelchairs, we all know that many mentally challenged people can be confined to wheelchairs… Altzheimers patients, various paraplegic patients, the list goes on. If one is confined to a wheelchair then they either have the dexterity to operate one and move around using their arms and hands, or, someone like a caregiver pushes them around. Now… imagine any of these folks in a power scooter with a joystick hand control. 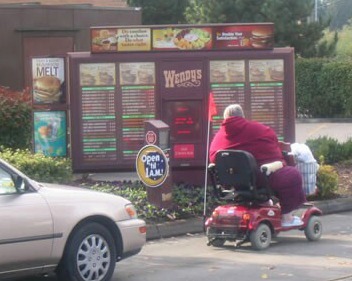 No need for a caregiver and the family is free from guilt in having to visit aging Aunt Edna all the time to schlepp her to the store; she has her own scooter. The question is seldom asked… should she have her own scooter and is she capable of driving the thing safely? I have witnessed on many occassion a lone scooter traveling down the road with a seemingly spaced driver at the controls; connected by hoses to an oxygen tank in the back, slumped down as if sleeping, their hand frozen on the joystick, their head bouncing wildly over each bump in the road. It always makes me wonder if the technology hasn’t just given Altzheimer victims, who would otherwise be found wandering the neighborhood on foot, a 29 mile per charge range. When someone in these things gets struck by a vehicle… well, it ain’t a pretty sight. While I was employed in the funeral industry I had to do a removal of a deceased scooter victim from the wheel well of the vehicle that struck him. This stuff is for real. Here’s what you do… with each sale of a new scooter the seller is required by law to apply an easily viewed colored label on the front and back. The colors, maybe three… red, green, and yellow… represent three “driving restrictions” of the driver. Green might indicate the driver is fully cognitive and physically agile enough to control a scooter in all situations. The yellow might represent those drivers who might get around in stores but not on main pedestrian walkways without a second person nearby. The red would indicate the driver should never travel without a caregiver/companion. In this way, drivers of vehicles and pedestrians can readily identify a scooter operator’s limitations and if there are problems the police or paramedics can be called to render aid before anything serious occurs. 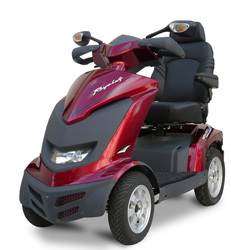 I am guessing it won’t be long anyway before municipalties and states see a revenue stream here and require scooter registration to control safety and regulate operator proficiency. In the meantime I have my eye on this one….. 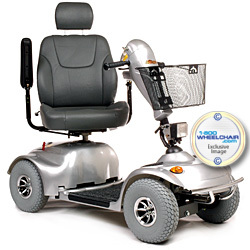 This entry was posted in Current Events, Marketing, Merchandising, and Product Madness, Social Issues and tagged Hoveround, Mobility scooter, Motorized wheelchair, Osprey, Scooter Store, Scooters, Walmart, Wheelchair. Bookmark the permalink. I love the one with tank tracks! But I want a .50 cal mounted on it too, and maybe an armoured cowling. 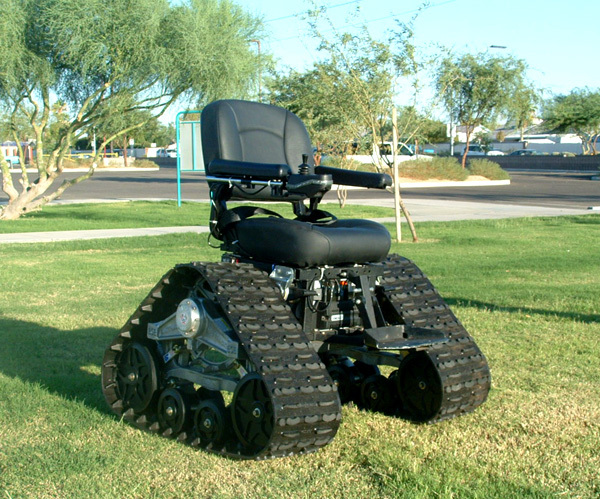 That would make dog-walking in the countryside much more fun!